Born in Fort Scott, Kansas on November 30, 1912, Gordon Roger Alexander Buchanan Parks had to leave home at 15 when his mother died. 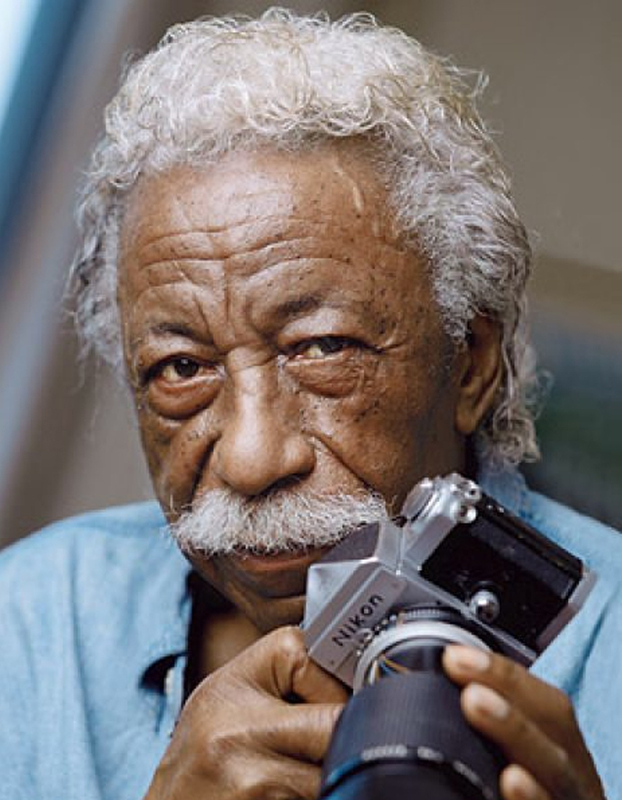 For the next 12 years, he lived mainly in Minneapolis, working as a piano player, busboy, dining-car waiter, Civilian Conservation Corpsman, and professional basketball player before taking up photography in the late 1930s and moving to Chicago. By 1942, his stature as a photographer was such that he was awarded the first Julius Rosenwald Fellowship in photography. He chose to work with Roy Stryker at the Farm Security Administration (FSA) in Washington, D.C.
During World War II, he served as a correspondent for the OWI (Office of War Information). Later, he joined Stryker at Standard Oil of New Jersey as a photographer working out of New York City and living in White Plains. During that time, he wrote his first two books, on photography, and began doing freelance fashion photography for Vogue and Glamour. In 1949, he joined the staff of Life magazine and worked there as a photojournalist until 1968, doing over 300 assignments and articles on a wide variety of subjects. Parks continues to write and photograph for Life occasionally, while pursuing his many other projects. During the 1960s, he became famous for his stories on the leaders of the Black Revolution, articles later incorporated into his book, Born Black. He was a founder of Essence magazine, and its editorial director from 1970 to 1973. He has written articles, poetry, and essays, and done photography for many major magazines, as well as commissioned portfolios of photography for museums. Author of the autobiographical bestselling novel, The Learning Tree (published 25 years ago and still in print in 9 languages) and two other autobiographies, A Choice of Weapons and To Smile in Autumn, he has also written four volumes of poetry and photographs ( Gordon Parks: A Poet and His Camera, Gordon Parks: Whispers of Intimate Things, In Love, and Moments without Proper Names) and a novel, Shannon. Parks is also a composer and filmmaker. His film career began in 1961 when he wrote and directed a documentary, Flavio, the story of a boy from a Brazilian slum, whom Parks had immortalized in Life and later, in 1978, in a book. Another famous Life story in 1968 became his second documentary, Diary of a Harlem Family, for which he received an Emmy award. His first Hollywood film was The Learning Tree, which he produced and directed in his hometown of Fort Scott, and for which he wrote the screenplay and the musical score. He then directed Shaft, Shaft’s Big Score (for which he wrote the classic music score), Super Cops, and Leadbelly. In 1984, he made a film from the diary of a nineteenth century freeman who was illegally enslaved, The Odyssey of Solomon Northup, which aired on Public Television’s “American Playhouse” series. The autobiographical Moments without Proper Names combines Parks’ photography, poetry, prose, and music. In 1989, Parks directed the film of his ballet Martin, for which he wrote the libretto and music to honor Dr. Martin Luther King, Jr. As a composer of classical works—sonatas, a symphony, concertos—as well as blues and popular music, he has had his work performed in the United States and abroad. Parks has received many awards for photography, writing, filmmaking, and humanitarianism. Among his most valued are the NAACP’s hugest award, the Spingarn Medal, and the Governor’s Medal of Merit, struck especially for him in honor of his being named 1985 Kansan of the Year. He is also the recipient of honorary degrees in literature, fine arts, and humane letters from colleges and universities across the country. Learning Tree Schools have been established in his honor, and the John F. Kennedy High School in New York City not only named its media center after him, but also gave him an honorary high school diploma—Parks had to leave school just short of graduation during the Depression. Parks continues to write (works in progress include a novel about the English painter, J. M. W. Turner, a book of poetry, and a fourth autobiography), compose (sonatas for each of his children), and photograph (a new commission for Alabama’s Birmingham Art Museum is being exhibited this year). Four major exhibits of his work are currently traveling in the United States and abroad. Gordon Parks lives in New York City, playing tennis when he is not writing or traveling to lecture at colleges. He has three surviving children, Toni Parks-Parsons, David, and Leslie (Gordon, Jr. was killed in a plane crash in Kenya in 1979), two grandsons, Alain Brouillaud and Gordon III, a granddaughter, Sara, and a great-granddaughter, Dannah.